The days are racing by. In a month’s time we’ll be off on our travels with nothing to do all day, every day, other than relax, enjoy ourselves and, of course, worry about whether we have enough money to live on. I’m sure that we’ll have no problems. My online income plus the remains of the rental income from Sally’s house after all the property insurance, letting agent fees, furniture storage costs and maintenance bills are paid should suffice. We’re not in a bad place financially but I suppose fear of the unknown is unsettling me a little. As a belt and braces exercise, from April onwards I will be studying travel writing and journalism in my free time with a view to improving my writing skills which will help improve the quality of this site and also increase the chances of me selling articles to the travel sections of newspapers and magazines across the land. That’s the theory anyway. I’ll let you know how the plan worked in real life at the end of the year. The worry about making ends meet without a regular income and without the benefit of a pension, state or otherwise, has prompted me to write about boating costs this week and how to keep them as low as possible. This week at work (only another five to go) has been quite tough. I twisted my back last week doing something very trivial but I have to work to earn a living so staying off work to nurse my injury wasn’t an option as far as I was concerned. Anyway, the cure for a bad back is often exercise. I think it’s supposed to be gentle exercise rather than brutal hard labour but I’m pretty sure that Calcutt Boats wouldn’t want to pay me for prancing around the garden for hours on end practicing Tai Chi. Preparing two railway freight carriages for removal was part of my exercise regime. Last week Pat and I stripped the heavy planking from the sides and floor of one of them and used our versatile Merlo fork lift to move the one tonne steel frame into the yard by our wharf. The initial plan was to have the frame taken off site and cashed in for the scrap value. The powers that be decided that it would be of more use sheltering the engineers in an external engine test area next to their workshop so we had to lift the unwieldy frame down a steep slope and over the roof of an adjacent store with the Merlo teetering on the brink of its safe operating limit. We dropped the frame into place without mishap, which probably came as a surprise to everyone given that I was driving the forklift, then returned to the laborious task of moving tonnes of engine spares from another of the dilapidated carriages. By Wednesday the second carriage had been emptied and taken off site so now we have a clear space for our smart new forty feet long steel container. The new storage container should be with us next week. Just to make sure that my aching back had all the exercise it needed, I spent Wednesday afternoon removing several hundred paving blocks, two dozen paving slabs and a tonne bag of sand from the walled garden of our lock-side cottage. I was sentenced to more hard labour on Thursday but this time I had an incentive. Two tonnes of creamy “Cotswold Buff” stone eventually arrived to dress the 100m long path from the north Locks marina access road to the dump barge where I will moor occasionally during the summer months and permanently throughout the winter from April onwards. To compact the six inch depth of road planings I dumped in the two feet wide clay trench I used to make the path a couple of months ago, the company hired a compacter, a heavy petrol engined Wacker. I collected the Wacker from a small plant hire company on an industrial estate in Southam first thing on Thursday morning then spent a couple of hours compacting the loosely packed road scrapings. I had to take an hour’s break to run a low temperature resistant “Arctic blue” power cable 100m down to the dump barge from the nearest available meter next to our temporary moorings between Calcutt Bottom and Middle locks. The cable had to be laid in a trench under the path and threaded through heavy duty hose to protect it from the site’s grass cutting equipment and stray spade thrusts. The stone turned up at 3pm so Pat and I had a couple of hours to wheelbarrow into piles along the path, rake it out to an inch and a half depth and then compact it with the Wacker. Fortunately the driving rain which tormented us all morning had stopped so we didn’t have to overheat in our rather ineffective padded waterproof jackets. Two tonnes of stone wasn’t nearly enough to finish the job. We now have fifty metres of black footpath leading on to another fifty metres of aesthetically pleasing cream coloured stone. We’re hoping another two tonnes will be delivered early next week so that we can finish the job. 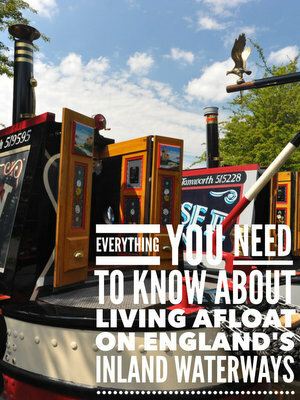 Living afloat is a wonderful lifestyle, but it isn’t particularly cheap. The cost of buying a boat to live on is far less than that of a home on dry land but the cost to run and maintain a “fully loaded” live aboard narrowboat is comparable to that of a small family home. Many live aboard boaters buy fairly large boats to live on then struggle to maintain the lifestyle as the bills mount up. A smaller boat and a simpler way of life means smaller bills and more time spent enjoying the lifestyle rather than worrying how to afford it. The feature which will have the most impact on the ongoing running and maintenance costs is the length of your boat. The boat’s length will have a direct impact on the cost of license fees, mooring and heating costs, cabin painting and blacking expenditure and, indirectly, your electricity generating costs because of the number of power hungry appliances you can cram on board. Here’s a breakdown of your boat’s areas of expenditure and what you can do to reduce the cost. License – The cost of your annual waterways license is determined by the length of your boat. The longest boat you can buy for the inland waterways is seventy feet. The maximum usable length is determined by the length of the locks on the network. A seventy feet long narrowboat will allow you to travel widely but you won’t be able to cruise on some canals with short locks. The current cost for a boat of this length is £1,056 with £100 discount for prompt settlement. The most common length for a live aboard narrowboat is between fifty and sixty feet but there are quite a few boaters living aboard narrowboats as short as thirty feet. A boat of this length will cost you £641.89 for a year with a £70 discount for prompt payment. Mooring Fees and Moorings – Mooring fees are often but not always determined by the length of your boat. We have two different marinas with two different pricing structures at Calcutt Boats. Moorings on thirty year old Locks marina are charged at £35.46 per foot per year. A thirty feet long boat would cost £1,063pa rising to £2,482 for a seventy footer. On the newer Meadows marina moorings are charged according to the lengths of the piers rather than the length of the boats. The majority of moorings have sixty feet long piers costing £2,346pa. There are a dozen seventy feet long piers costing £2,737pa. I’m concentrating on narrowboats rather than wide beams in this article but if you wanted a mooring on one of our seventy feet piers for a wide beam, because you would need two narrowboat moorings you would be charged £5,474 to moor in Meadows marina. In addition to the basic mooring fees, you need to be aware that some marinas also charge a joining or reservation fee, high usage fees and electricity infrastructure charges. It’s possible to avoid mooring fees completely by continuously cruising all year round but you need to be mindful of cruising restrictions due to essential canal and lock repairs, getting stuck in ice for brief spells during the winter months and the logistics of spending extended periods negotiating extremely muddy and unpleasant towpaths, again, usually over the winter months. Blacking – Your boat needs to be lifted out of the water roughly every three years to have the hull repainted. There’s usually a flat fee for removing the boat from the water, £200 at Calcutt Boats, plus a cost per foot for the combined pressure washing, wire brushing and hull painting. The current rate (I think) is £5 per foot so a seventy feet long boat would cost £350 to paint plus £200 for lifting in and out. The total cost for a thirty feet long boat would be £350. You can rent a slipway or a wet dock so that you can do the work yourself but by the time you have factored in the cost of the dock/slipway hire and the cost to hire a pressure washer and industrial wire brush you probably won’t have saved much money, but at least you would know that an important job was done thoroughly. Painting – Getting your boat professionally painted it very expensive. As a guide, you should budget £100 per foot. You don’t have to have your boat painted by professionals, but you do need to make sure that the steel is always protected by a good layer of paint. I painted my own 62′ long boat in April 2012. The finish was far from perfect but doing the work myself saved £4,000 after materials paint tent and equipment hire was taken into consideration. Now, after three years, I need to spend some time touching up numerous scratches, scrapes and flakes but I’m still quite pleased with the work overall. Sally and I are considering repainting the cabin sides but I don’t think that the ten days we’ve booked a tent for April will be long enough to do everything. Painting your own boat is quite time consuming and there’s a fairly steep learning curve but like everything in life, the more you practice, the better you get. You don’t have to paint your boat in a variety of colours or adorn it with fancy sign writing. Just paying a professional sign writer to add my boat name, James No 194, and this web site address to both sides of the cabin is going to cost me £500. I could buy adhesive vinyl lettering for much less than that. If you really want to save yourself money, and you’re not bothered about aesthetics, you can simply keep your boat protected by several coats of the same coloured primer. If you want to save even more money you can do what the owner of two boats featured in many of the national boating magazines has done. He had a boat built to his own design and high specification. The first boat, Valhalla, looked like a stealth bomber, especially he painted everything, including the cabin, with bitumen hull paint. Several years later, he had a wide beam boat built, also along the stealth bomber lines, and also totally protected by bitumen. He told me that he repainted his boat every year at a total cost of under £200. Cabin size/heating – The cabin of my 62′ traditional stern narrowboat is forty eight feet long. It’s heated by a single solid fuel stove located on the starboard side four feet from the forward bulkhead. Three gravity fed radiators are heated by the stove’s back boiler. The cabin is always warm at the front of the boat but can be ten or fifteen degrees colder in the back cabin because of the distance from the stove. If I had a typical boat stove such as the Morso Squirrel, I could use the very popular Ecofan to push warm air further down the cabin. Unfortunately an Ecofan won’t work on my stove because the stove’s double top plate doesn’t allow the top of the stove to get hot enough to power the fan. As far as I’m concerned, and I’ve not met any live aboard boaters who disagree with me, every live aboard boat should use a solid fuel stove as its primary heat source. Central heating systems are often far more convenient to use, especially during spring and autumn periods with warm days and cold nights when you just need a quick burst of heat at either end of the day to take the chill off the boat, but mechanical systems can and do go wrong, usually when you need them most. My stove has been in my boat since it was built in 1977. The flue has been replaced several times and the glass changed quite often but, apart from that, it has been providing a reliable heat source now for thirty eight years. I use coal briquettes in my stove. It’s a more effective fuel than unseasoned wood which is often used on boats and easier to light and keep alight than coal. I use about two tonnes of the stuff each year but, partly because of the size and layout of the cabin and partly because of the boat’s insulation, the boat is rarely hot. Having effective insulation, a central stove, draught proof windows and a smaller cabin will drastically reduce your annual heating bill. My insulation is polystyrene which isn’t very effective. Spray foam insulation is used these days. It’s far more effective than mine. I also used to lose a great deal of cabin heat because of the wind which whistled through the poorly fitting hopper windows. I’ve completely resolved the problem now by fitting secondary double glazing panels. I used to dread windy winter days on our exposed mooring because I knew we’d be living in a wind tunnel. Today, I can see banks of grey cloud scudding across the pale blue sky propelled by a 30mph south westerly, but not a breath of it is sneaking into our cabin to steal the heat. A small solid fuel stove is all you need to heat a narrowboat with a small cabin. Even with the stove on its lowest setting, you’ll have the front doors open on the coldest days to prevent the cabin from overheating. Another cost cutting benefit of a solid fuel stove is your ability to use it for cooking. Foil wrapped potatoes placed in the ash tray beneath the stove will bake to crispy perfection in a few hours and the hot top plate will allow you to slow cook casseroles or keep water hot for drinks or washing up. If you are going to rely on a central heating system on board, try to steer clear of gas. Gas central heating has two disadvantages. Firstly, it is prohibitively expensive to run if you are going to use it for extended periods. I know several people who have purchased ex hire boats to live on. They have been horrified to discover that they needed to replace a 13kg cylinder every three days at £27 a time. The other disadvantage is that unlike a solid fuel stove which removes moisture from the air and so helps reduce condensation, gas heating actually adds moisture to the air so increases your chances of having problems with damp. I’ve just about exhausted my boat heating knowledge now but here’s some additional information for you if you want to know more. On board electrics/battery bank/charging regime – This is a very important aspect of your floating lifestyle to get right. If you’re going to be on a static mooring with a shore power supply permanently plugged in, you can ignore this section and pretty much run the same equipment on your boat as you would in a house. However, as soon as you unplug your shore supply and start cruising you need to be very careful what electrical appliances you use and how often you use them. 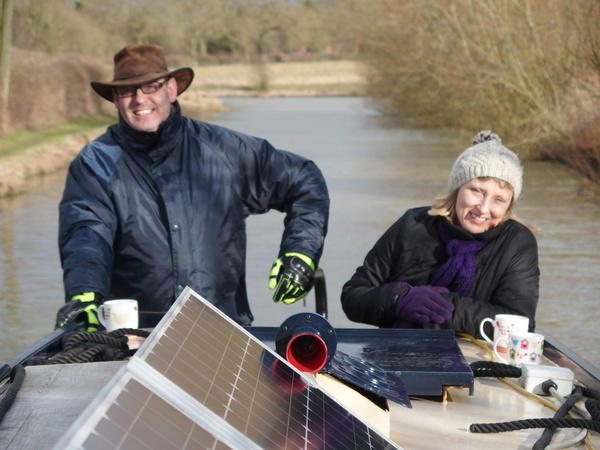 A narrowboat’s on board electrical capabilities range from a basic setup with two or three batteries to accommodate a simple 12v supply to a combination of built in generators and large battery banks to allow a wide range of appliances to be used on board, including electric cookers. Batteries are consumables so you need to budget for their replacement. Lead acid batteries will last you two to three years. AGM batteries cost about 50% more but will last up to three times as long. AGM batteries also need no maintenance at all because, unlike lead acid batteries, you don’t have to check them regularly to ensure that the distilled water is kept at the right level. It’s possible to live a simple life with just two or three fairly low capacity batteries. One is usually reserved exclusively for starting the engine while the rest will supply your 12v needs. The basic 12v electrics on your boat will probably be the fridge, internal and external lights and the water and shower pump. With a basic setup like this you won’t be able to run any 230v mains appliances, but you can buy a 12v television which will run directly from the battery bank and you can purchase an adapter so that you can charge your laptop. Our own electrical needs fall somewhere in the middle. When I first moved on board, the boat had a very basic 12v supply with just two 110ah batteries. There were also 230v sockets throughout the boat but they could only be used if the boat was plugged in to a shore supply. Over the last four years I’ve enhanced the electrical setup considerably with the long term goal of making the boat fit for long term fairly high electrical use off grid. I started off by having a battery charger fitted so that I could keep the batteries topped up when plugged into the shore supply. The I replaced the single 110ah battery in the domestic bank with two larger capacity 135ah batteries. About eighteen months later I realised that the two batteries weren’t enough so increased the domestic bank to four. I also added a 1600w pure sine inverter so that I could use mains appliances while we were cruising. Then I had three 100w solar panels fitted. I am delighted with the solar panels. Even on a chilly but sunny late winter day like today, the panels are generating 10-15amps which is enough to keep my 12v supply topped up. If you’re interested in solar power, here’s an excellent guide. Last month I decided to replace the four 135ah lead acid batteries in my domestic bank with long life AGM batteries. With careful management, the new batteries should last me seven to ten years. Careful management is the key. An essential tool for keeping your batteries healthy is a battery monitor. If you are away from a shore supply, you will usually top up your batteries by running your engine. Running your engine to top up your batteries is a very expensive way of generating electricity. Unless you have a battery monitor, you don’t know how long to run your engine before the battery bank is adequately charged. Run the engine too little and the batteries will be insufficiently charged which will shorten their life and increase your maintenance costs. If you run the engine for too long, your batteries will be fully charged but you will be wasting expensive diesel. My battery monitor is a Smartgauge. It’s been fitted into the bulkhead between the engine room and our bedroom with the digital display facing into the bedroom. The display shows me the number of volts going in to the battery bank which, to be quite honest, I don’t understand, and the battery bank’s current state of charge expressed as a percentage which, thankfully, is a figure which I do understand. I check the display twice a day, first thing in the morning and late in the afternoon. I have to run the engine twice a day anyway when we are away from a shore supply to replenish the hot water stored in the calorifier (immersion tank) under our bed. An hour is enough to heat the 55l tank and usually more than enough to top the batteries up but, thanks to the monitor, I know whether I need to run the engine longer. The final weapon in our electrical arsenal is a suitcase generator. The 1,600w inverter we have isn’t powerful enough to run four of Sally’s essential appliances;her hair dryer, hair straighteners, vacuum cleaner and iron. Personally, I could do without all of them but that’s probably because (A) I have very short, easy to manage hair and (B) I’m a typical male slob. It’s misleadingly called a suitcase generator because it’s supposed to be portable. However, the 35kg dead weight isn’t something I would like to haul around with me on holiday. Getting it out of the engine room on to the towpath to run it is as far as I ever want to carry it. The generator is rated at 2,600w so it will run all of the appliances Sally wants plus my own personal power hungry weakness, my Nespresso coffee machine. I could spend hours talking about boat electrics if I had the time and knowledge to do it justice. I have neither. Fortunately for both you and I, someone who has probably forgotten more about on board power use than I could ever hope to learn has written comprehensively about the subject here. It’s a subject you need to get your head around regardless of whether you use a boat for recreational cruising or as a primary home and the article I’ve linked to is possibly the clearest and most easy to understand explanation I’ve read. I know you’ll find it useful. Engine maintenance – Your engine is the heart of your boat. It needs looking after and looking after your engine means regular servicing. I’m going to be running my engine this year much more than I have in previous years. The 50+ discovery days scheduled for this year will account for at least four hundred and fifty hours. When I’m not hosting the training days we’ll be cruising continuously from April until the end of November. I realistically expect to run the engine for 1,000 hours or more in total this year. With a recommended service interval of two hundred and fifty hours I will require four or five services before the end of the year. If I ask a boatyard or River Canal Rescue to do them for me, I will need to find £500-£600 for the labour plus the additional cost of any parts required. At the beginning of last month I paid RCR £175 for a “one to one” engine service. The engineer spent five hours with me explaining how to do a full service. At the end of the service, he gave me a comprehensive list of tools and engine spares to keep on board. I’m not the most practical person in the world, but I now realise that servicing my engine isn’t rocket science. I now have the confidence to do all the basic engine servicing myself and save a sizable chunk of money each year. Toilet costs – There are three different types of narrowboat toilets; pump out, cassette and composting toilets. Composting toilets are the least popular because they require you to get much closer to your processed food than you probably want and because they usually need adapting to make them work in our humid island climate. Normally, you’ll find either a pump out or cassette toilet on board your boat or, for those adopting the belt and braces approach to on board waste management, both. Each toilet type has its pros and cons. The pump out toilet is the closest you’ll get to a toilet in a house. The big difference is that boat toilets don’t have the same volume of water available when you flush them to get rid of any residue. I’m afraid, this is something you just have to live with on board but a pump out loo is best if you want a normal toilet experience. Another advantage of the pump out toilet is that, with a coffin sized holding tank, you can last a month or more before you need to empty it. The two main disadvantages of this type of toilet is that you have to take your boat to a pump out station to empty the holding tank, which can be very difficult or impossible if the canal is frozen, and each time you have the tank emptied, you have to part with £15-£20. Many boat owners with pump out toilets also keep a cassette toilet on board. Cassette toilets are usually free to empty. The downside is that you have to carry a holding tank weighing up to 20kg through your boat’s narrow walkway then hold the upturned tank quite close to you while yesterday’s meals gush into an open sewer, and you have to do it two or three times a week. I’ll be running the discovery days on the first ten days of April, June, August, October and December next year. As spring approaches more and more site users are booking the relatively few discovery days still available. In the last week alone, four dates for June and two for August have been reserved. April is now fully booked apart for one date for a single person, and just five of the thirteen June dates remain. If you are interested in joining me for a fun and information packed discovery day please check the diary before it’s too late. In the meantime, meet September 2013 discovery day attendees Katrina and Mark Urch. “We purchased our boat during the summer last year and plan to travel the canal network for a year starting end of March this year. Apart from a very hurried couple of days when we hired a boat for the first time last Easter and a maiden voyage on our own when we first bought it, we had no experience of boating. We realised we didn’t know very much at all and thought some tuition and guidance before we set off would be a good idea. Despite it being a cold winter’s day we received a lovely warm welcome (and coffee). Your boat gave us a few pointers on how we should maybe change some things on ours and some food for thought. Both Mark and I said how patient you were and your instruction were very clear (even if I did still keep steering the wrong way). I am more confident now that in time I will relax and enjoy our journey and the “step” is definitely on the list to purchase/make. The day was definitely worth doing. Your knowledge and expertise were very welcome and seeing how you have adapted your boat to living aboard was extremely useful. The hands on experience on the day has set straight a few things we were doing wrong and given us some information to take forward with us.